Ankle braces are designed to offer ankle support and protection for a variety of injuries. Choose the best ankle brace according to the severity of your injury or level of ankle support needed for your activity. To help prevent your ankle from rolling over during athletics a lace-up ankle brace style provides the highest level of ankle support for maximum protection and a precise fit. For acute injuries like ankle sprains, a stirrup ankle brace is a good choice that provides support and makes walking easier and less painful. For low-level ankle support and compression, a sleeve provides mild to moderate support with a low-profile design. They help reduce swelling from rolling an ankle. For light to moderate support, an ankle wrap with wraparound straps helps provide moderate protection. This ankle brace style provides added support for arthritis and recovery from sprains and strains. For moderate to maximum protection against ankle rollover injuries and athletic use, a figure-8 lace-up ankle brace is recommended. These ankle braces offer the best support for sports that involve jumping and twisting. For the highest level of support, choose a hinged ankle brace design with lace-up softgoods over it for the highest level of protection against recurring ankle injuries. A good ankle brace can provide both comfort and functional support allowing for an early return to activity. Our products provide support for ankle ligaments so you can recover and heal quickly. If you have already suffered previous injuries then our ankle support braces can give you the extra support you need to prevent further injury from occurring. Need help finding the best ankle brace for a particular injury or condition. Our product experts can help you find the right ankle brace for your needs or use our filters to help make your search easier. 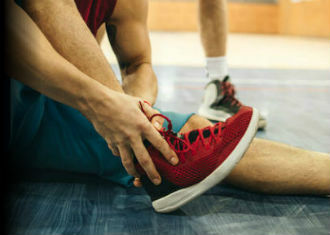 We have different types of ankle braces including elastic, neoprene, medical, latex-free, rigid hinged, and sports ankle bracing for functional support and comfort. Our wide selection of braces can help protect and treat ankle injuries so you can return to an active lifestyle quickly. They fit inside most shoes easily and deliver breathable comfort and support so ankle ligaments can heal after being injured and swollen.